As we near the end of this homeschooling journey for my oldest (don’t worry I still have three more kids to go and many more years of homeschooling!) I can’t help but think about all of the worries I had early on. There were so many things that kept me awake at night…that almost stopped me from even starting this journey. Thankfully, He led me to press on and here we are. Yet, I wanted to address the major concerns I had, and to show you how they never really were an issue…because I know many of you out there may be in just the place I was 13 years ago…a scared mom feeling the calling to take this step but unsure of where it would lead. And really…you will never know the ourcome in the beginning. In fact, you aren’t supposed to. It is a journey that has to unfold as you go, and you need to trust God. Am I really capable to teach my children? Yes and no. I say that because am I really capable of anything in life? Not on my own, but with God of course. If He calls you to something, He will equip you. And NO you do not need a college degree or teaching certificate to teach your own children. The myriad of curriculum choices available these days and the world we live in where anyone can learn anything with all of the information available to us has changed that thinking. I want my children to ultimately become independent learners anyway. Our world has changed in that if you are able to research, you can learn anything. So absolutely, we are all able to teach our children and to teach them to teach themselves. Will I teach them enough? What is enough really? K-12 and then learning stops? Nope. I have taught them as much as I could as best as I could, knowing there will always be gaps. We never stop learning on this earth and the gaps will only ever be filled in heaven. So, these are some of the bigger things that kept me awake at night early on. How about you? I would love to hear what worried you and if you still worry or how God has relieved those worries. Share in the comments below! Author Karen DeBeusPosted on March 28, 2019 March 28, 2019 Categories Bible StudyLeave a comment on Are You Focused on Externals or Eternals? I have heard from many parents lately that have said they don’t feel equipped to teach the Bible to their children. They think they don’t know enough of the Bible or about the Bible, so they aren’t comfortable teaching it to their children. Rest assured, if that is you, I want to encourage you today. If you have a Bible, you are equipped. God is the One who wrote it, and He is our Master Teacher. Trust the One who wrote the words to teach you. I am not a biblical scholar or a theologian, yet I love God’s Word. And that is what I want to pass on to my children. We do not have to have a degree in the Bible to teach it to our children. In fact, what a beautiful thing to learn together! I believe that God equips where He calls. And He definitely commands us in the Bible to teach His Word. So we must trust Him. And in this day and age with an abundant amount of resources available to us, we can find ways to study the Bible like never before. This is not by any means a comprehensive list, but some of my top resources. We also love to include sermons, videos, podcasts, and more. Just always make sure they are reputable and solid in teaching. The abundance of information also means the abundance of fluff or “junk”- be discerning! Do not be intimated by the Bible. It is God’s very own words to us. He wants to teach us. Go to Him, and lead your children to Him. You will be transformed by His Spirit! 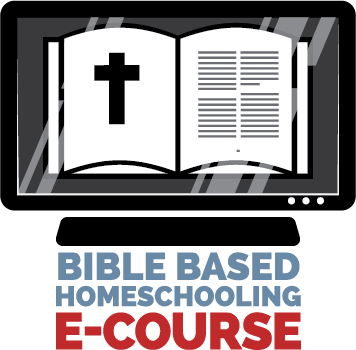 Bible Based Homeschooling e-Course is NOW Available! 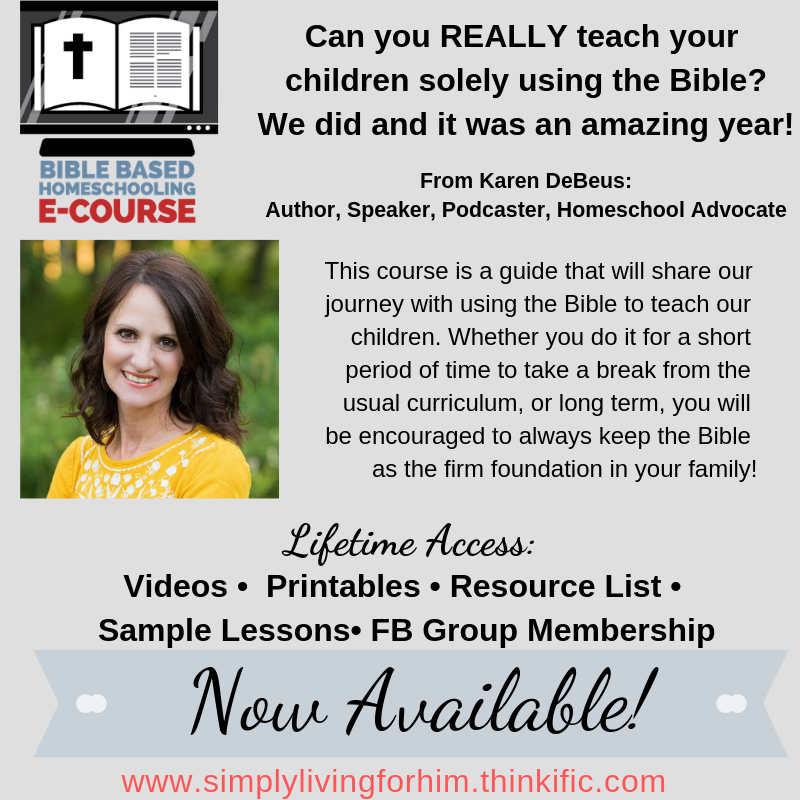 Author Karen DeBeusPosted on March 13, 2019 Categories Bible StudyLeave a comment on Bible Based Homeschooling e-Course is NOW Available! Bible Based Homeschooling E-Course Coming Soon! This course is a guide where I will walk you through exactly how we used the Bible as our main textbook in our homeschool for one year. So many folks have asked me over the years just how we did it, and I sat down to make this course as a guide, but not a curriculum! I want to inspire and equip you if God is leading you to do this, and even if not, to remember that the Bible is still the foundation upon which we build our homeschool. Videos include how we did each subject, frequently asked questions, lessons learned, and more! •Downloadable and printable resources for planning and record keeping plus for prayer, goals, etc. •Free Lifetime Membership to a Facebook group to connect with other families and share ideas, ask advice, and even for prayer! PLUS, I will continue the encouragement with videos in the group, sharing resources as I find them, and sharing our journey as we do this AGAIN next year with our youngest! Yup, we are doing it again and I can’t wait! Look for the e-course soon! We are so excited to share it with you! Author Karen DeBeusPosted on March 7, 2019 Categories Bible StudyLeave a comment on Bible Based Homeschooling E-Course Coming Soon! As we approach the end of this journey for our oldest child, I have learned that homeschooling is more than books. Homeschooling is more than tests. Our kids are more than a curriculum. From the early years on, I pored over curriculum catalogs, dreamed big dreams of what our days would look like, spent hours researching the best methods, and ultimately life proved much different than those early dreams. Homeschooling is a way of life, and education is not limited to the quantification of a test grade. My kids have learned far beyond walls of a classroom. That time we bought a house, sold our house, and then it all fell through? They learned about some real life there- mortgages, inspections, attorney reviews. All things I never knew about until I was an adult! Those times learning how to raise animals here on our little hobby farm- building coops and barn stalls, planting and harvesting a garden, milking goats? Not just skills that involved science and math, but skills you can’t just learn about in a book. Caring for living creatures, showing compassion, responsibility, and dedication. The times that we walked through deep sorrow and grief as tragedy struck in lives close to us? Difficult times, but life lessons for sure. Attending funerals, handling grief, being there for friends, and dealing with emotions as they drove us to our Savior’s arms. Lessons that can never be taught in a book. The joys, the excitement, the highs…all experiences that must be lived. Not taught in a book. Relationships that have been built. Bonds that have formed. Our family is a so tight-knit and close, all because we have lived each day together. So while I remember those early years of thinking I need that perfect curriculum, that perfect set up, that perfect room, that perfect method. I see that the only perfect was really the life God was creating for us to live…and the learning as we went. Experience has after all been, the best teacher. I am scanning the web for some ideas for Bible-based lessons for Thanksgiving. Sight and Sound Theatres- Where the Bible Really Does Come to Life! I was recently given tickets to attend Sight and Sound Theatres production of Jesus in Lancaster, PA. This was our third show at Sight and Sound, and it was even more spectacular than the others. I don’t even know how that is possible! Sight and Sound Theatre is known for its jaw-dropping sets and animals and stage that semi-surrounds the theater. In past shows, we have watched in awe as the whale in Jonah floated over the audience. We marveled at the animals that were on stage and brought up and down the aisles in others shows, truly immersing the audience in the experience. And most of all, with each show, we have experienced the Bible literally come to life and heard the Gospel in ways that touched our hearts because of the live production and telling of the Scriptures. And Jesus. Wow, this show did not disappoint. I feel like I need to see it again and again because there is just so much to take in. From the moment the show started I just knew this was going to be more than I imagined. The use of digital backdrops combined with enormous moving sets that surround the theater is magnificent. They literally made the boat rocking through high waves in the sea as Jesus actually walked on water. Towns and temples larger than life filled the stage. You feel like you are truly there. Soldiers on horseback, camels through the aisles, birds flying overhead. It’s indescribable. It will blow your mind to see these Bible stories in action. You must experience it to grasp the magnitude of these shows! Teaching our children the Bible is an integral part of our family. And being able to take them to shows at Sight and Sound adds so much to our love of the His Word. After each show, we have been able to discuss so much of the Bible from what we experienced in the show. It is the perfect Bible-based field trip! If you are in the area of Lancaster, PA or Branson, MO you will definitely not want to miss a show at Sight and Sound Theatre. Head over to their website today for more info and to see the Bible come to life for yourself! For years I have put my hair up with the standard ponytail holder. It ends up with looking kind of childish or just messy. Yes, I often sport a “messy bun” around the house! I really love this clip. For someone with medium length hair, it is just perfect. I always want to get my hair out of the way when I’m working outside, homeschooling, cooking, or just working around the house, and this is a fashionable way to do so! I am also thrilled about this headband. This is something I probably wouldn’t have purchased because I wouldn’t think it would work for me, but I absolutely love it. It’s so pretty and adds a gorgeous touch to an everyday hairstyle. I highly recommend it! You can enter below to WIN your $20 gift credit to Lilla Rose! Author Karen DeBeusPosted on August 29, 2018 Categories GiveawaysLeave a comment on Lilla Rose Giveaway!